This giant diffuse nebula is one of the largest H II regions (composed of ionized hydrogen gas) in our Milky Way galaxy. The star forming nebula NGC 3372 has produced the very conspicuous peculiar star Eta Carinae, which is among the most massive and luminous stars in our Milky Way, and perhaps in the universe. Our image was obtained by David Malin with the 1.2-meter UK Schmidt Telescope. It is copyrighted and may be used for private purpose only. For any other kind of use, including internet mirroring and storing on CD-ROM, please contact the Photo Permissions Department (photo at aaoepp.aao.gov.au) of the Anglo Australian Observatory. The Eta Carinae Nebula was discovered by Abbe Lacaille during his 2-year journey to the Cape of Good Hope in 1751-52. Lacaille made two catalog entries situated in the region covered by this object: Lac III.5 and Lac III.6, which the elder literature both identifies with NGC 3372. While the description of III.6: "Large group of a great number of small stars, little compressed, and filling out the space of a kind of a semi-circle of 15 to 20 minutes in diameter; with a slight nebulosity widespread in space", matches well with what Lacaille should have seen in his 0.5-inch refractor, he describes III.5 as: "Two small stars surrounded by nebulosity". Ronald Stoyan has found that close to Lacaille's position for this object, there is indeed a small cluster, Collinder 228, which would match Lacaille's description when observed with such a small telescope. Collinder 228, or Cr 228, is only one of 8 cataloged open clusters within the area of this huge star-forming region; the others are Bochum (Bo) 10, Trumpler (Tr) 14 (also cataloged as Cr 230), Tr 15 (= Cr 231), Cr 232, Tr 16 (= Cr 233), Cr 234, and Bo 11. 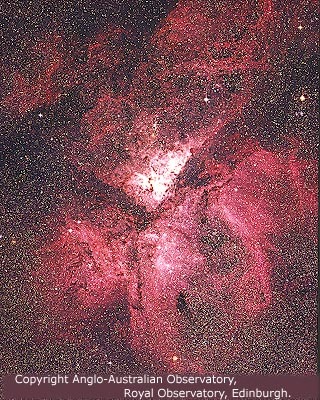 Star Eta Carinae is involved in open cluster Trumpler 16. NGC 3372 is rich in nebulous detail and regions formed of bright and dark interstellar matter. Among the most conspicuous nebulous features are the Keyhole Nebula, formed by its brightest part and darker material, and the so-called Homunkulus Nebula around the star Eta Carinae itself. In John Caldwell's observing list. In the Astronomical League's Southern Sky Binocular Club list. Caldwell 92. Bill Arnett's Eta Carinae and NGC 3372 photo page, info page.